Hey Yall! How was your three day weekend? Is your child/children on winter break this week? My girls' school district only had the three-day break with the girls returning to school on Tuesday with a couple of shorts days due to Parent-Teacher Conferences. Usually, I take advantage of when the girls are out of school and take a mini family vacation, but I wasn't in the mood to travel somewhere. All I wanted to do is park my tush on the couch and catch up on my shows and rest a bit. I know that's surprising with the fact that we're always traveling somewhere, but with a new house I want to settle down a bit and take comfort. Finally, I feel like I'm in a home that I enjoy, not a place that I feel I'm getting taken advantage of by a landlord, or can never settle because I'm always moving. Plus, traveling all the time was getting expensive since 90% of my travels expenses comes out of my pocket. But hey, I'll be back traveling, just not as often as I did last year. Plus, I'm discovering there is so much to do and see right in my own backyard. Atlanta is filled with rich history, culture, entertainment, restaurants. And to think I didn't much care for Atlanta, I was busy with my nose in the air and an I-don't-want-to-be-here type attitude because ATL is not the life I'm used since I lived in the San Francisco, Bay Area for almost my whole life. I don't have many friends here; they're all back in my home state or scattered around somewhere in the US, leaving me pretty much a loner in Atlanta, which is another reason why I haven't cared too much living here. 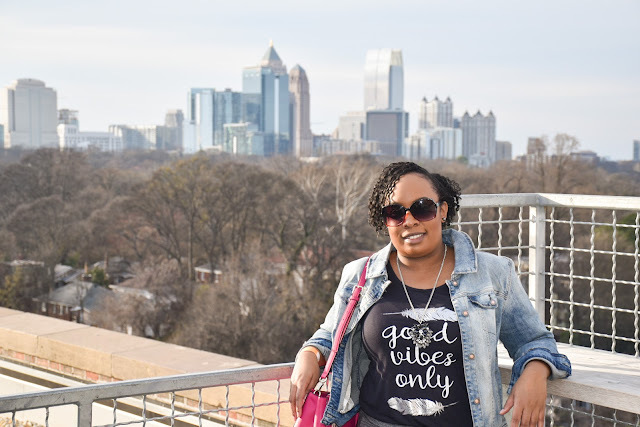 However, thanks to blogging, being invited to events around town helped me to discover all the different things Atlanta has to offer. So, one of my goals this year is to be a tourist in my own hometown. So as I was saying about being a tourist in Atlanta, I did a bit of site-seeing over the three-day break by visiting The King Center and Skyline Park. Last month, I took the family to see a play about Martin Luther King Jr. to kick-start Black History Month learning more about his legacy. I'm fascinated reading up on his history and how he fought for equal rights in a non-violent way. The exhibit includes Dr. King's birth home, the Montgomery Bus Boycott, how he was inspired by Gandhi's success with non-violent activism, him being the first Georgian to receive the Nobel Peace Prize, reflecting pool, and so on. All of us, except Michelle thought the exhibit was great. She was bored and wasn't up for reading all the artifacts. Michelle is like how I was when I was her age; I wasn't into history at all, it was one of my least favorite subjects. My thoughts were, who cares about the past, the past is the past, why must we keep reliving it? But as I've gotten older, I see the importance of learning about my history. History has a way of repeating itself, so it's vital to know about it. Lauren, on the other hand, loves learning about history it's her favorite subject along with studying about different countries. Hopefully, someday Michelle will see the beauty of learning about the past. And she better get used to visiting museums because there will be more we'll be hitting up in the future. If you're ever in Atlanta, visiting The King Center is a must on your activity list, plus it's free! I was shocked by the free admission, that's rare to see when visiting museums. After our educational adventure, we took a 10 min drive to Ponce City Market for lunch/dinner. Mr. M and I been there before when we went on our Day Date (remember that? ), this time I wanted the whole family to experience it together, as well as see the new Skyline Park. Skyline Park is on the roof top of Ponce City Market, with mini carnival-style activities, bar, restaurant, and breathtaking panoramic views of the city. The downfall is that it cost $5 per person to go up to the park, and the activities cost as well. Could be because it keeps the crowd size down and keeps the riff-raff out. However, I'll come back again once or twice a year whenever the family and I are in the area. The girls enjoyed themselves, and that's all that matters. Have you been a tourist in your own hometown lately? I went to the King Center once and I enjoyed it a lot. When I was in college I actually went to Ebenezer Baptist quite often. I don't know if they still do this, but when I was a Spelman the churches would have buses to pick up the students and bring them to church. I loved going to Ebenezer because they sent us back with a lunch. I first ate salmon patties from one of those lunches. I even met Corretta Scott King at Ebenezer over the King holiday weekend one year.